Kneeling Woman dates from Lehmbruck’s time in Paris and reflects the radical shift his style underwent there. In his quest for an ethereal type of art he rejected traditional representation in favor of expressive distortions, in particular the figure’s elongated proportions and lyrically outlined silhouette. Her solemnly bowed head and supplicating pose further emphasize the message of spirituality. There is another version in cast stone in the Museum of Modern Art, New York. Other plaster versions are in the Lehmbruck Museum in Duisburg, Germany, and with the artist’s family. 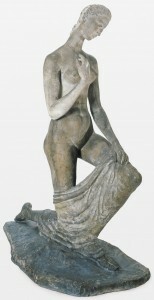 He exhibited a plaster version at the Salon d’Automne in Paris in 1911 and the Berliner Secession of 1912. See Dietrich Schubert, Wilhelm Lehmbruck: Catalogue Raisonné der Skulpturen, 1898-1919 (Worms: Wernersche Verlagsgesellschaft, 2001). Wilhelm Lehmbruck to Walter Pach, December 6, 1912, microfilm reel 4217, frames 101-102, Walter Pach Papers, Archives of American Art, Smithsonian Institution. In fact, Lehmbruck sent Standing Woman, not Large Torso, to New York, so it is unclear why he mentioned “grand torse” in his letter. William M. Fisher, “Sculpture at the Exhibition,” Arts and Decoration (March 1913): 169. Adeline Adams, “The Secret of Life,” Art and Progress 4 (April 1913): 929-931. James William Pattison, “Art in an Unknown Tongue,” Fine Arts Journal 27-29 (May 1913): 299. The drawings were sold as a set to Mrs. Clara Davidge for $81. Standing Woman was sold to Stephen C. Clark for $1,620. See Wilhelm Lehmbruck to Elmer MacRae, July 14, 1913, microfilm reel 4131, frames 912-914, Elmer Livingston MacRae Papers, Archives of American Art, Smithsonian Institution; and Wilhelm Lehmbruck to Elmer MacRae, September 22, 1913, microfilm reel 4131, frames 918-920, Elmer Livingston MacRae Papers, Archives of American Art, Smithsonian Institution. See Gordon B. Washburn to Louis Carré, Paris, May 26, 1938, Lehmbruck file, Albright-Knox Art Gallery, Buffalo, New York; Walter Pach to Gordon B. Washburn, May 31, 1938, Lehmbruck file, Albright-Knox Art Gallery; and Louis Carré to Gordon B. Washburn, September 20, 1938, Lehmbruck file, Albright-Knox Art Gallery. Gordon B. Washburn to Louis Carré, December 30, 193, Lehmbruck File, Albright-Knox Art Gallery. Lehmbruck studied art and sculpture at the School of Arts and Crafts in Dusseldorf and at the Dusseldorf Art Academy in his native Germany before moving to Paris in 1910. There he befriended avant-garde artists including Alexander Archipenko, Aristide Maillol, Henri Matisse, Amedeo Modigliani, and Pablo Picasso. Under their influence, he transformed his style from the academic, highly traditional approach he had practiced in Germany to a more spiritual mode characterized by angular, attenuated figures that express a sense of melancholy and uneasiness. Lehmbruck exhibited at the Salon de la Société des Beaux-Arts annually from 1907 to 1911 and in the more radical Salon d’Automne in 1910, 1911, and 1914. He remained in Paris until 1914, when the outbreak of World War I prompted him to move to Berlin. In 1917 and 1918 he was in Zurich to avoid military service, and in 1919 returned to Berlin, where he suffered a mental breakdown and committed suicide. See Dietrich Schubert, Wilhelm Lehmbruck: Catalogue Raisonné der Skulpturen, 1898-1919 (Worms: Wernersche Verlagsgesellschaft, 2001).